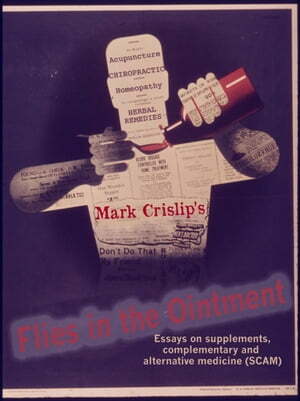 Collins Booksellers - Flies in the Ointment by Mark Crislip, 9781938463693. Buy this book online. A carefully selected and edited compendium of the best of Dr. Mark Crislip (the Puswhisperer's blog posts from sciencebasedmedicine.org. The sections have been edited for redundancy, updated for 2017, and classified into themes. Possible: mostly botanicals and herbal remedies. There is nothing impossible that a given plant product will affect a given disease, although often the provenance of a given herbal treatment is suspect. Impossible: the rest of CAM. It will be equally impossible to cover every CAM practice, so just a few are treated in depth. What's the Harm? A general discussion of why SCAM is bad for people, animals, and the environment. Alt-Facts: Why Scientific Thinking is Hard. A discussion of how and why our powers of logic are often powerless against SCAM. Counting to Ten: Statistics for the Rest of Us. A somewhat technical section about statistical errors and fallacies, and why interpreting the literature is difficult even for clinicians. A must-read for lovers of math. Realm of the Possible. A discussion of supplements, including the evolution of my thinking on probiotics. Eliminate the Impossible. Impossible treatments, their fallacies and risks. Vaccines and Flu Woo. The fallacies behind anti-vaccination beliefs, and why you should always get your flu shot.